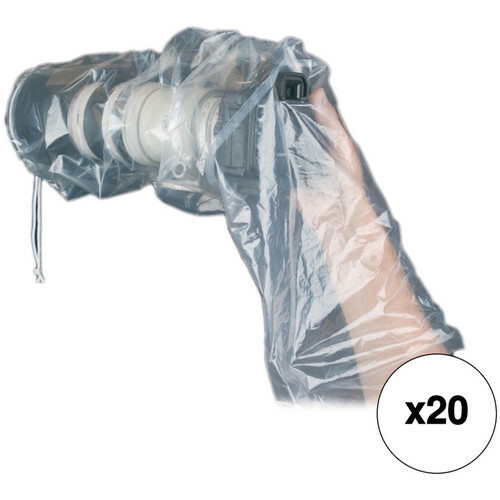 This OP/TECH USA 18" Rainsleeve Kit from B&H provides a set of 40 polyethylene sleeves made to protect an SLR camera with a lens up to 7" in diameter and 18" in length. The sleeves protect your gear from dust and inclement weather and are designed for both handheld and tripod use. They feature an eyepiece opening that works with most viewfinders and the clear design allows you to see camera and lens controls. They also feature a drawstring lens opening for a snug fit. This kit includes 20 sets of two rainsleeves. The OP/TECH USA 18" Rainsleeve (Set of 2) is a polyethylene sleeve made to protect an SLR camera with a lens up 7.0" in diameter and 18" in length. The sleeve protects the gear from dust and inclement weather. It is designed for handheld use or tripod application. It has a unique eyepiece opening adapts to most viewfinders for viewing through the lens. Camera & lens controls are easily visible and operable through the sleeve. Drawstring lens opening offers easy access and a snug fit. There are two Rainsleeves included. Polyethylene case made to protects your gear from dust and inclement weather. Camera and lens controls are easily visible and operable through the RainSleeve.